Originally published in 1979, Beyond the Fragments (BTF) was an intervention in the left by three British socialist-feminist activists who offered a thoroughgoing critique of democratic centralism and the vanguard party ideal as it was then practiced on the revolutionary left. BTF argued that left groups had failed to capture the creativity and enthusiasm of the tremendous numbers of people who had entered political activity in the 1960s and 70s. The authors recognized the necessity of an organization capable of gathering the energy of social movements and union struggles—the “fragments”—and focusing that energy on a revolutionary vision and anti-capitalist politics. However, they argued that the left would inevitably fail unless we were ready to revolutionize ourselves, taking on board insights from the women’s liberation movement. The current edition includes the original work and each author’s reflections, thirty-odd years on, in which they locate their intervention in the context of the late 1970s and then assess where they have moved to and how they think about the same questions today. In their contemporary reflections, the authors try to capture the political environment within which they wrote. The 1970s had seen the rise of conservativism, increasing attacks on unions, and cuts in the welfare state. And the authors were well aware that gains made through struggle can always be rolled back. Still no one envisioned the extent and power of the coming defeats. Rather than attributing the revolutionary left’s marginalization to the political times—as we might be tempted to do today—the authors believed that the left could do much better. Indeed, it was the strength and scale of the social movements, working class community and shop floor organizing in the 1970s; the authors’ own participation as activists in a range of issues; and their experience of the political and theoretical inventiveness and the extraordinary breadth of women’s liberation groups and projects that gave them the confidence to make this intervention in the left. The current edition is actually the third. The first Beyond the Fragments was a small book built around Rowbotham’s essay “The Women’s Movement and Organizing for Socialism,” with short commentaries by Lynne Segal and Hilary Wainwright. They originally intended to print 1,000 copies, but Rowbotham insisted that they do 2,000 so Segal and Wainwright (who had full-time jobs and put up the money for printing), could get their money back. The book sold out very quickly and generated a lot of discussion and opposition. When Merlin Press offered to reprint the book, Wainwright and Segal substantially expanded their essays—partly to take into account the critiques and to more fully communicate their arguments (10-11). The book remained very controversial on the left. According to Rowbotham, one left paper published two opposing reviews because of disagreements on the editorial board. I remember myself being very conflicted. I understood many of the negative patterns of democratic centralist organizations that Rowbotham so pointedly described—I lived them in the International Socialists (IS). On the other hand, I resisted mightily the idea that these patterns reflected the “Leninist” party form itself. Partly this was because, at least on some key questions such as support for the autonomous self-organization of oppressed people and for caucuses (such as a women’s caucus) within the revolutionary party itself, the American IS was much better than the British Socialist Workers Party. Perhaps even more important, I was defensive of positions that had been hard won for me over my young political life, for example, that the working class, organized at the point of production, was the primary revolutionary subject, that the Russian revolution would have failed but for the strategic intervention of the Bolsheviks, and that a party capable of making such an intervention was a party with deep connections to the most advanced workers and with a democratic centralist organization, where after discussion and debate all were disciplined to carry out the line. I had also struggled personally to develop my intellectual capacities and my skills—such as public speaking—along the model that male leaders offered. Upon first reading the original edition of BTF, I focused more on what was missing than what BTF had to offer. But the book, and the discussions it generated, had planted a seed—one that my subsequent experience in the revolutionary left would validate and encourage. When I helped to form Solidarity as what we hoped would be a new kind of organization, I was already moving away from the basic tenets of democratic centralism. Reading BTF today, including the authors’ contemporary reflections, I feel even more aligned with their socialist-feminist critique of democratic centralism and particularly with their approach to building “left” organization. It is unfortunate that since 1979 the organized revolutionary left has made so little progress in finding an organizational form that would help us break out of our marginality, although there continue to be interesting experiments (for example, Left Roots). For this reason, BTF retains value for revolutionary activists and organizers. As Rowbotham says, the context of BTF was framed by twentieth-century experience and particularly the existence of strong unions and social democratic and labor parties, the enduring touchstone of the Russian Revolution, and debates about the nature of China and the Soviet Union. Much of what was taken for granted in the arguments on the British left—for example, the strength and reach of national unions, the traditions of working-class support for the Labor Party—has evaporated, and thus some of the arguments made in BTF might not resonate directly with contemporary activists. Wainwright, for example, writes in the current edition that upon reading her original essay she was quite shocked by the amount of time she devoted to talking about the party-focused dilemmas of the British left (51). Yet, the questions these socialist-feminists identified remain central: how does consciousness change? What is the role of a revolutionary organization? What should it do? Should revolutionaries engage with the state, and if so, how? What would a participatory, democratic, politically and intellectually open left organization look like? How can we make our political organizing, organizations, and projects “pre-figurative” of the society we want to win? While acknowledging their failure to fundamentally shift how the left understood itself and recognizing the serious demoralization that ensued from the disorganization and defeats of the 1980s and 1990s, the authors remain hopeful. They write about the importance of the struggles against neoliberal capitalism and austerity, struggles that have animated creative protests across the globe and particularly the democratic participatory elements within those movements. Segal points to the melding of personal expression and political discourse in the street protests of a new generation. Approvingly, she quotes an observer of the Greek anti-austerity protests in the squares, “The poems recited, the personal stories and historical references narrated, transformed public speaking from instrumental and demagogic act into artistic performance, making it deeply political.” Wainwright surveys how the same impulses that formed the participatory, democratic ethic of women’s liberation continued to percolate and widen their influence through the twenty-first century in a variety of experiments, such as the participatory budgeting of the Brazilian Workers Party and the dense national and international networks of grass-roots activists stimulated by the “horizontalist” Social Forum process. Both Segal and Wainwright reference Syriza as an exciting, innovative, left-unity project, which remains rooted in and gives political expression to grass-roots movements. For example, rather than using state funding to support the parliamentary party organization, Syriza directed resources to the Solidarity for All Network—the hundreds of self-organized/self-help local projects (soup kitchens, farmer’s markets) that had sprung up to meet the everyday needs of people suffering from the economic crisis and welfare state cutbacks (52-53). In both editions, BTF strikes a very different tone from most left writing (whether from the anarchist or socialist traditions). It is exploratory and non-definitive. The authors believe strongly that the insights of the women’s liberation movement and its practices, however imperfect and problematic they were, have something important to offer the left (see, for example, page 141). They acknowledge that they have no answers to the issues they raise. They argue instead for experiment, trying things out, and rejecting the tired dualities that have so hamstrung real dialogue on the left (for instance, whether to seek to reform the state or to build alternatives outside of it). For every experiment or effort they discuss, they report the difficulties and limitations. Instead of saying, “Aha, you see that failed, proves us right to have opposed it,” they argue for analyzing our experiences and our strategies, together in an open-hearted way. In writing BTF, their disgust with the overweening certainties that have so often characterized the left was matched by their confidence in the collective production of knowledge, which they experienced in the women’s liberation movement. There, without received wisdom and already existing sacred texts, women activists had to “make their road by walking” and to rely on each other’s recognizably very partial contributions in order to come to a consensus or approach—one that was expected to last only until more information and experience could be used to revise it. (Please, reader, do not jump up to say that many times women’s liberation projects and groups fell short of this ideal—BTF authors are quite aware of these failures and acknowledge them openly.) It was from the “best” of women’s liberation that the authors built their suggestions for how to move toward a different sort of left. Their inspiration came from other political experiences as well. Both Segal and Wainwright had been participants in organizing local socialist centers. (Presentations at those centers were the origins of the first BTF.) The socialist centers brought together shop floor/trade union rank and file activists and community-based organizers hungry for achieving solidarity, strategic clarity, and a broader left presence in society. There was a sense that these disparate groupings and projects, locally based but not parochial, were groping toward a new kind of revolutionary organization and culture. Wainwright describes how the decision-making norms of the Tyneside Socialist Center were shaped by both the shop stewards’ very explicit structures for democratic decision-making and accountability, and the feminists’ commitment to a “horizontalist” organization. Additionally, Wainwright references her participation in the shop stewards movement and its democratic from-below organizing, while Segal describes the influence of her first political activism within the left-libertarian counter-culture and its many local collective projects. They are not afraid to talk about their personal experience as a source of knowledge. Indeed, they argue that unless the left recognizes and pays attention to the psycho-social and emotional aspects of activists’ lives and organizations, the left will fail to understand some of the most powerful sources of conservativism (and divisions) within the working class and will stifle the potential of our organizations to nurture activists’ personal capacities and their contributions to the development of knowledge. 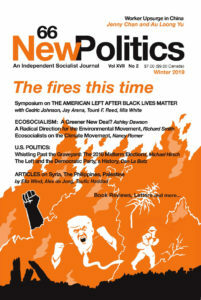 The contemporary left (with some dishonorable exceptions) has made tremendous strides compared to thirty years ago in terms of recognizing the importance of autonomous organizations of oppressed people and in terms of recognizing that struggles around “personal issues” such as access to abortion or sexual assault can be as fruitful a source of radicalization as struggles for union contracts. However, as demonstrated by the recent upheavals in revolutionary socialist organizations (as well as anarchist projects, union caucuses, and non-profit groups) in response to their failure to address gender violence within their ranks, not enough progress has been made in changing left culture, and, in particular, the masculinist styles of leadership, the strength of informal hierarchies, and the assumptions about knowledge and whose knowledge counts that BTF so trenchantly criticized. Here we would all do well to listen to what BTF has to say. This somewhat sprawling work is difficult to summarize and I do not wish to flatten out the complexities that the text recognizes by condensing arguments the authors take some space to lay out. Here, then, I will just point to some themes in hope that readers will be intrigued enough to read in more depth. 1) The importance of organizing through political differences rather than by suppressing them. The democratic centralist model demands closure in order to create the basis for unified action. The ideal of the vanguard party—coherent in its analytic framework and program, and united in its actions—is a recipe for factionalism and splits (167-171). The notion of a vanguard, and of identifying those with “advanced” versus “backward” consciousness, fails to acknowledge the contradictory and very mixed consciousness that feminists had come to identify as a “normal” part of being a political activist. Rowbotham did criticize the general tendency within the women’s liberation movement to reject as “Leninist” all attempts to assess consciousness. We do need to think through “who is likely to stick their neck out in particular circumstances,” she says. However, the Leninist parties tended to identify certain groups as “advanced” without appropriately considering the very mixed nature of their consciousness (for example that skilled workers militant in defense of their control over work could also be conservative in defense of their position as family patriarchs). Within the revolutionary left, the definition of “advanced” tended to incorporate unacknowledged biases that party members brought with them into the organization (195-198, 210-211). 2) A feminist critique of knowledge and leadership in the revolutionary left. BTF criticized the ideal of the party as the bearer of scientific knowledge as well as the premium placed on familiarity with the Marxist and Trotskyist foundational texts and the historical experience of political parties. As an historian, Rowbotham certainly values learning from history. All three authors had read the books that formed the intellectual currency of the party left. But they also came to see that reliance on this knowledge as the touchstone for revolutionary analysis and strategy inevitably set up a (masculinist) status system in which the kinds of knowledge that emerged from this learning trumped other forms of knowledge. If leadership required a deep familiarity with a particular body of theoretical/historical knowledge, then too many people would be ipso facto excluded from exercising leadership. In particular, they argued that “the social production of knowledge has many sources: practical, emotional, historical, theoretical” (42). Wainwright pointed out that the radically democratic and participatory shop stewards movement of the 1970s, as well as women’s liberation groups, “quite self-consciously ensured time and space in their organization[s] to share and reflect on people’s sometimes tacit knowledge and also draw on academic research” (43). Further, the BTF authors argued, the ideals of leadership central to left culture were fatally flawed. The women’s movement had demonstrated that “it was not just what you said and did but how you said and did things which transmitted your politics (176). Furthermore, personal capacities crucial to building an effective organization had too long gone unacknowledged and unsupported in the revolutionary left: “the ability to relate to people, to express feelings directly; to recognize and express difference and personal needs; to take care of one another” (175). 3. An appreciation of local community-based organizing. Having been involved in setting up many different “local” projects (newspapers, women’s centers, tenants organizations, child care centers), the BTF authors were well aware of the limitations of “the local” (for example, limited perspectives and knowledge based on local particularities and the potential for a kind of cozy parochialism). However, they were inspired by the range of local organizing that engaged so many women in meaningful collective action—women’s centers, conferences, publishing groups, theater groups, folk and rock bands, film collectives, trade union caucuses, and food co-ops are aspects of the women’s movement (141). In their experience, local projects had nourished the sort of loving, supportive culture within which activists could take the personal, intellectual risks necessary to creatively develop their analysis and politics. Again, all three authors were very honest and clear-sighted about the failings of these same groups—exclusiveness, personalization of differences, emergence of informal hierarchies, divisiveness to the point of destruction, to name a few problems. They simply proposed that, with all their flaws, the new group cultures, group dynamics, and participatory democratic norms of the women’s liberation movement should be tried out, their mistakes learned from, and the practices further developed within the left. Today, the revolutionary left is less likely to completely dismiss community-based organizing. But, at least within my left circles, there is still a skepticism about “localism” and community-based organizations (especially those with paid staff) that does not apply to unions or “point of production” organizing, regardless of the flaws and weaknesses of those efforts. 4. An insistence on the value of “pre-figurative” politics. This grew out of their experience in the women’s liberation movement, which itself drew inspiration from participatory left currents. Beyond attempting non-hierarchical forms of decision-making and direct democracy, feminists were engaged in setting up community-based organizations, such as women’s health clinics and child care centers, that challenged the business as usual of health care and child care provision. Some of these were autonomous, self-help organizations, for example, cooperative nurseries. Some were existing, state-funded organizations transformed by the workers, parents, and patients involved, for example, a clinic in a public housing project. In 1979, the revolutionary left considered these as hopelessly utopian or even counter-productive to building a national movement. In contrast, the authors argued that these projects open up a broader political vision for the working-class people who are involved. As Rowbotham says, “Self-help community activity is not a substitute for the equally important radical struggles within the welfare state sector. But [it] can indicate ways of questioning the role of professionals and the means of creating more direct forms of control over welfare resources” (224, 248). 5. A “both/and” approach to the anarchist/socialist debates around whether the left should engage with the state or build autonomous institutions (224). It wasn’t just that we widened the areas of political activity in which the left had been active in order to include women’s needs. There was also the recognition of the need to have control over any gains we might make. For instance, in the demand for nurseries, we didn’t just demand money from the state for more nurseries, but helped to create more community-based, non-authoritarian, non-sexist relations in the nurseries we helped to establish (252). Again, what is most notable about all three authors’ reflections is their appreciation for the creativity and innovation showed by contemporary movements such as the Arab spring, Occupy, left initiatives like Syriza, and the whole panoply of radical organizational experimentation that has characterized the response of workers and communities to the neoliberal assault. Clear-eyed about the challenges, Segal, Wainwright, and Rowbotham continue to place their hope in the (broadly defined) left’s ability to find organizational forms and political practices that express the feminist, pre-figurative, participatory, democratic spirit that moved them to write Beyond the Fragments. Johanna Brenner does labor and community activism in Portland OR. She is an Advisory Editor of Against the Current and a member of Solidarity: A Socialist, Feminist, Anti-racist Organization. Her recent publications include “Selling Sexual Services: A Socialist-Feminist Perspective,” Logos: A Journal of Modern Society and Culture v. 13, no 4 (2014) and “Caring in the City,” Jacobin, Fall 2014, Issue 15/16.